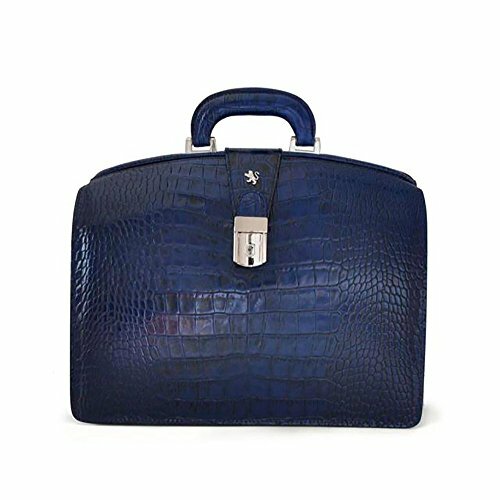 The Brunelleschi: King Croco Range Collection - Small Italian Calf Leather Lawyer Briefcase is the best briefcase for the working man or woman featuring three interior sections to help keep you and your belongings on track! This briefcase is a uniquely hand printed leather briefcase made with 100% Italian calf leather (croc finish) with all natural tannin extracts that makes every skin of leather on this briefcase tremendously flexible and durable, ultimately creating a true work of distinction. Compartments include one large zippered pocket, middle pocket for computer or tablet, two pen holders, a cell phone holder and one small open pocket. Contains full brass swiss combination lock. Garment dust cover bag included. If you have any questions about this product by Pratesi, contact us by completing and submitting the form below. If you are looking for a specif part number, please include it with your message.